Vladyka Theodore (Pozdeyevsky) was arrested for the first time in June 15, 1920, and on July 12 was sentenced to the camps “until the end of the Civil War” for anti-Soviet agitation. He served his term in the Butyrki and Taganka prisons. On October 25, 1920 his term was shortened in accordance with the amnesty to five years. “In accordance with the will of the prisoners, Divine services were permitted, and a schoolroom in the prison was set aside for them. It was a small, well-lit hall with school benches and some portraits on the side walls: on the left – Karl Marx, on the right – Trotsky. There was no iconostasis in this improvised church… But there was a table covered with a white cloth, and on it stood a chalice for the celebration of the Mystical Supper, a cross and a Gospel… A seven-branched candlestick had been made of wood by some prisoners. Everything was simple, as it was, perhaps, in the catacombs of the first Christian centuries. “The usual celebrant was Metropolitan Cyril, tall, with his majestic figure, regular features and wide grey beard. Bishops Theodore and Gurias concelebrated with him. Also standing there were Igumen Jonah with his concentrated, somewhat severe face, and the simple and serious Fr. George. 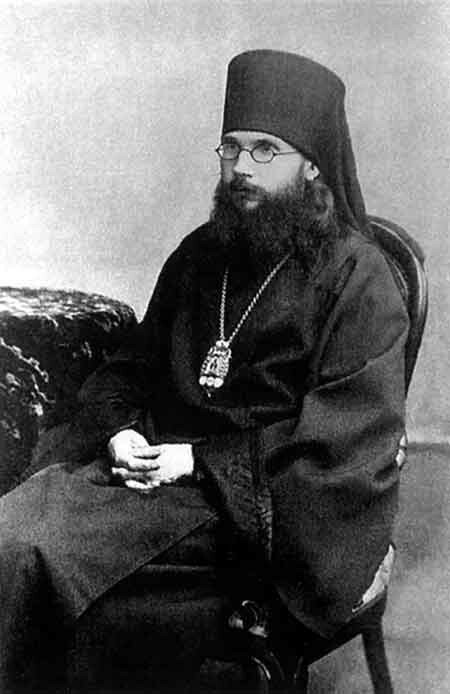 The choir was directed by the former Over-Procurator of the Holy Synod, A.D. Samarin. And how they chanted! Only suffering could give such life to the hymn-singing… Many of those present also chanted. How much feeling and profound experience is in the words of the Gospel: ‘Blessed are they that weep, for they shall be comforted. Blessed are they that are persecuted for righteousness’ sake, for theirs is the Kingdom of heaven.’ As for those who suffer, not for the Faith, but only for their sins and crimes, their brokenness of heart is poured out in the prayer: ‘Lord, have mercy’, or in the penitential sigh of Great Lent: ‘Have mercy on me, O God, have mercy on me’. “Behind the small table, Professor Kuznetsov was selling candles. The prisoners loved to light them. In their quiet flicker they felt a warm, prayerful atmosphere which was reminiscent of the sketes of ancient piety, of the monastic life. “The next day he met me again on the staircase and gave me a big bouquet of lilac. It was obvious that he wanted to soothe the pain which his words of the day before had caused me.